Be familiar with the network interface card (NIC) for the A+ Exams and understand its benefits. 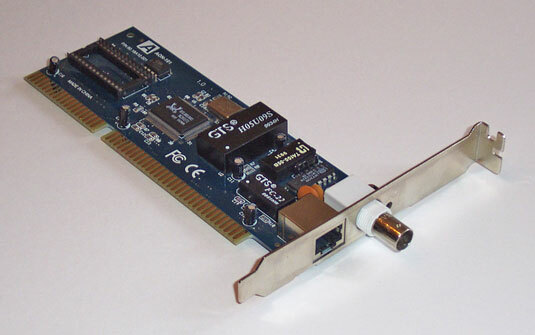 The network interface card (commonly referred to as a network card) is responsible for connecting the computer or device to the network. More importantly, the network card on the sending computer is responsible for converting digital data into an electrical signal for copper or optical signal for fiber that can be placed on the wire. The network card on the receiving computer is responsible for picking up the electrical signal and then converting it back to digital data that can be understood by the computer system. Each network card has a unique address burned into the ROM chip on the card. This unique address is considered the hardware address of the network card because the manufacturer of the card burns it into the card. The address uniquely identifies your system on the network. The hardware address is also known as the Media Access Control (MAC) address. An example of a MAC address is 00-20-3F-6B-25-13. Looking at the example of a MAC address, notice that the MAC address is made up of hexadecimal addresses — not your typical decimal numerals or binary values. Of the six groups of digits, the first three pairs identify the manufacturer of the network card, and the last three pairs are a unique set of digits assigned to a particular card built by the manufacturer. So, 00-20-3F, which appears at the beginning of my example MAC address, represents the manufacturer of the card, and 6B-25-13 identifies the card. The MAC address of the sending and receiving system is stored in the header of the network packet that travels the network wire. When each system sees the packet traveling by it, it looks at the destination MAC address to decide whether the data is destined for it. If a system finds that it is the intended recipient for the data, it copies the data to its buffer, which is memory used to store the information while it waits to be processed. The figure shows a network interface card. Two lights on the network card act as status indicators — the activity light and the link light. The link light is always lit when you have a connection to the network; the activity light blinks when the network card is sending or receiving information. When troubleshooting network problems, always check that the link light is on, indicating a connection to the network.